Sites with the highest bounce rate typically have the lowest average time on the site. The more interesting your site is, the more time visitors will stay on your site. Less friction = More sales/leads! It is true - you can make statistics say just about anything you want. EVERY Web site should have Google analytics running - it's FREE. 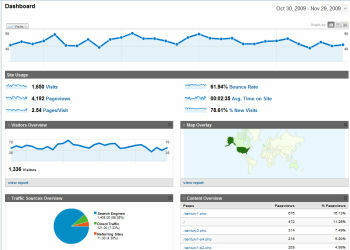 Many sites have Google Analytics running, but very few site owners/webmasters take the time to analyze the analytics. I cannot over-estimate how important the stats are for Web site performance and improvement. Recently while looking at the traffic stats for one of my clients I noticed that a particular page was the second most visited on the Web site AND had a bounce rate of 83%. So 8 out of 10 people who arrived at this page left the site altogether! The short-term decision was made to eliminate the page and consider improving it later. MORE visitors will stay on the site - MORE will become leads! The overall bounce rate is the average for the entire site - what percentage of visitors leave the site after viewing only their initial page. In a survey of Web sites from several industries, the average site bounce rate was 45%. See the survey stats and learn a bit more about bounce rates. For most sites the contact page is where you want the visitor to go - the exit percentage from the contact page is important. In my survey, the average exit rate on a Contact page was 34%. If your contact page or quote page has an exit rate of more than 40% you probably have too much "friction." See the survey stats and learn a bit more about how to avoid "friction." You want to reduce the "friction" on your "action" page - Less friction means more sales/leads. Call or contact me to discuss your "action" page. I will be happy to discuss what friction you might have and how we can make your contact page work better. I can HELP you get ROI on your site.